An avenue of honour was planted in memory of those from the district who died in service or were killed in action during World War One. The living memorial features 40 mature oak trees which represent fallen soldiers from the district. The trees are planted on either side of the avenue. 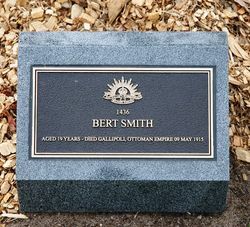 The Avenue of Honour was constructed to commemorate the Centenary of the Gallipoli landings, which was commemorated in 2015. 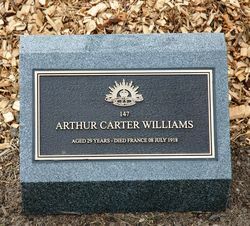 Funding was provided by the ANZAC Centenary Grants Program. 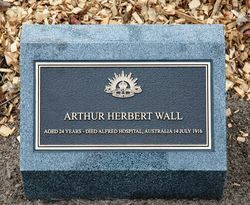 Individual plaques and an honour roll commemorate the men and women from the local district who served in the First World War. It is also a tribute to the servicemen and women who will serve our country in the future. The line of 40 oak trees that form Kooweerup’s new Avenue of Honour could not have had a more appropriate address than along Rossiter Road, where the old railway station once stood. Prominent local businessman Michael Duff pointed out at Sunday’s official opening ceremony that the place those 40 district soldiers who didn’t make it home are now honoured was possibly the last place they saw. 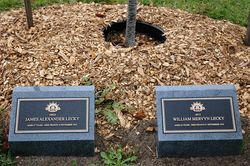 Each of the 40 trees are dedicated to a different soldier, marked by a plaque, and their service detail is explained in an accompanying memorial wall. 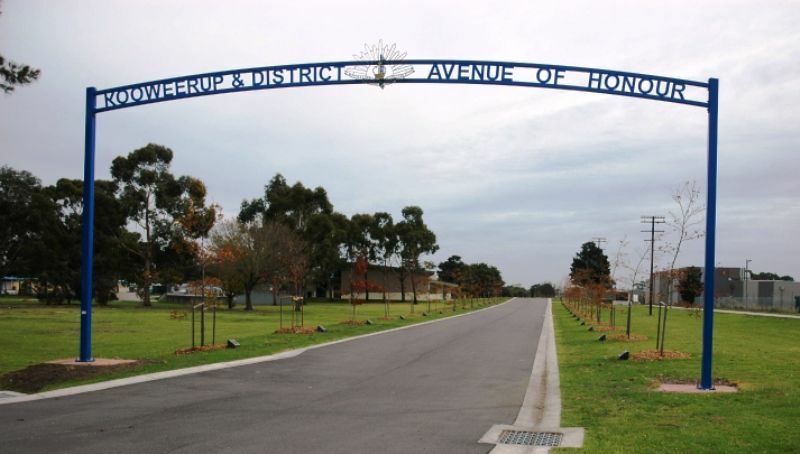 The Avenue of Honour is the latest project for the Kooweerup sub-branch under the leadership of president Ron Ingram, following on from the 2007 opening of the new cenotaph in nearby Cochrane Park. Next, they want to establish a military museum as part of redevelopment plans at the bowls club. The big crowd that turned out for the opening could have been forgiven for thinking they had been transported back in time to the Great War era. Bernie Dingle and his crew from the Light Horse and Field Artillery Museum and Nar Nar Goon were out in force, as was the Great War Re-enactment Association. There were World War I soldiers and nurses wandering around the place everywhere – even Simpson and his Donkey made an appearance. 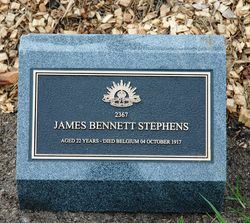 They formed part of a Catafalque Party that wound its way up Rossiter Street as former Kooweerup Secondary College principal Geoff Pledge, an honorary sub-branch member, read the names of all 40 soldiers as CFA members and local Scouts unveiled the plaques. Singer Brian Candy gave a rousing rendition of When The Band Played Waltzing Matilda, Joan Davey read the Lord’s Prayer, Geoff Stokes The Ode to the Fallen and the re-enactment association members performed a presentation of arms that had the local Cubs and Scouts covering their ears. The avenue was consecrated and dedicated by Reverend Mark Kelly. Cardinia Shire deputy mayor Graeme Moore and his Port Ward colleague David Young, whose mother Wilma was a decorated former POW nurse in World War II, officially opened the memorial wall and Mr Ingram was joined by Lieutenant Melanie Verho from HMAS Cerberus in laying a commemorative wreath. MC Peter Bottomly then wound up what was a wonderful tribute event and invited the crowd into the adjoining community centre for morning tea.